Eswatini has a growing environment for women entrepreneurs to realize their business building ambitions. So, it was good to see over 100 of the country’s leading women entrepreneurs gathering at the Royal Villas for the first Lioness Lean In event to be held in the country on 21 March. The event aimed to give women entrepreneurs in the country the opportunity to share their business building stories, inspire one another, and connect for greater business success. The Lioness Lean In Eswatini event was hosted by Lionesses of Africa in partnership with Standard Bank. 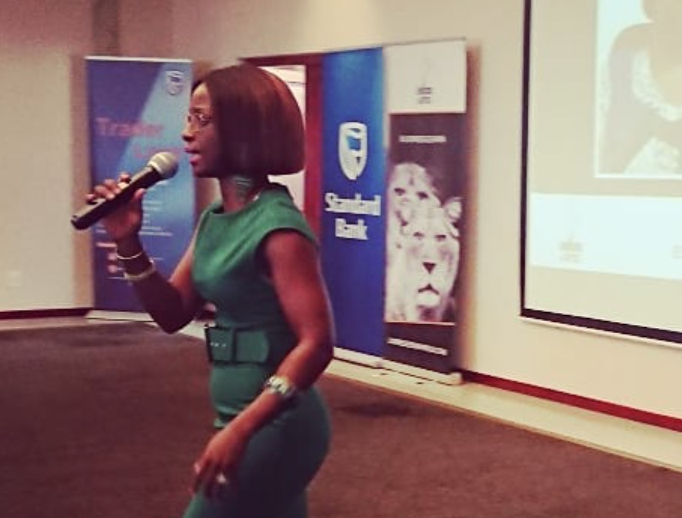 True to the bank’s Brand Philosophy in the country - “Eswatini is our Home, We Drive Her Growth” - Standard Bank encouraged the leading women entrepreneurs in its network to connect with fellow women in business from the Lionesses of Africa community at this inaugural Lioness Lean In event. The morning’s agenda got off to a great start as women entrepreneurs gathered for a breakfast and networking session, getting the opportunity to meet one another, make important connections, and open up new business opportunities. The networking area was set up as a marketplace, with local women micropreneurs and small business owners showcasing their brands and selling their products to attendees. This element of the Lioness Lean In events is always popular with attendees. The event programme formally get underway with opening remarks and a welcome address from Lionesses of Africa’s Lean In Ambassador for Southern Africa Region, Hlubi Mboya Arnold, and Betty Murambadoro, Head of Corporate and Investment Banking at Standard Bank Eswatini. Hlubi presented an overview of the work of Lionesses of Africa to empower and support 1 million women entrepreneurs across the African continent. She also shared some of the major initiatives currently being rolled out by Lionesses of Africa and also plans for the remainder of the year ahead in Eswatini and beyond. Other highlights on the programme included the showcasing of leading, successful business women entrepreneurs from Eswatini who were each given the opportunity to share their start up stories with the audience, to showcase their products and services, and importantly, to talk about their personal experiences of building their businesses. Women entrepreneurs showcased included: Swane Meyburgh, founder of Alpha; Busisiwe Ndlela, managing director of BBX Pty Ltd; Sylvia Mthethwa, founder of Progress Stationery; and Thokozile Vilakati-Jele, Ocean Basket Franchisee, Eswatini. Each of the women entrepreneurs had insightful stories to share and inspired all those attending the event. Speaking on behalf of Standard Bank, The Head of Business Banking, Nomfundo Myeni said they were excited to host this event for the first time in an effort to leverage on the opportunity to speak to the entrepreneurs in attendance about the Bank’s product service offering in line with offering support for the start of Small and Medium enterprises across the country. Nomfundo encouraged women in business not to miss out on an opportunity to engage with other local business women who are making an impact in the world of business saying this is an opportunity for women to rediscover their passion and work towards starting up business ventures in line with the local and regional market needs. The highly popular Lioness Launch session followed, with Hlubi Mboya Arnold introducing women entrepreneurs who are currently launching exciting new products during the month of March. These included case studies featuring Gugi Intimates, a luxury specialist ladies lingerie brand from South Africa; Sapelle, a global lifestyle and accessory brand from the African Diaspora in the UK; Atelier Fifty Five, a great new online platform for Africa’s women creatives; Star Reflexion, a bespoke leather boot and shoe manufacturer from South Africa; and Africology, a luxury spa lifestyle brand from South Africa that is now globally renowned. Leveraging off the Lioness Launch theme, Hlubi offered the opportunity to 5 women entrepreneurs in the audience to pitch their own new products, services and businesses to the rest of the gathering, giving them important exposure and access to new markets. She then returned to the speaker podium to announce some exciting new initiatives that will benefit the women entrepreneurs of Eswatini over the coming weeks. Speaking on behalf of event sponsor, Standard Bank, Chantell Littler, Head of Enterprise Banking, shared news and information on the bank’s product service offering for those attendees who fall into the SME category of business. The event then came to a formal close with a speed networking session, with women entrepreneurs encouraged to introduce and pitch their businesses to one another in one minute. This highly effective way of making new business connections is very popular with women entrepreneurs attending each Lioness Lean In event around the African continent.